Toronto Clear View Window Cleaning uses only experienced professionals to clean eavestroughs in Toronto, the GTA and souther Ontario region. Eavestrough Cleaning requires the proper skill and equipment. Our ladders are equipped with padded mitts to protect your eavestrough / gutters. 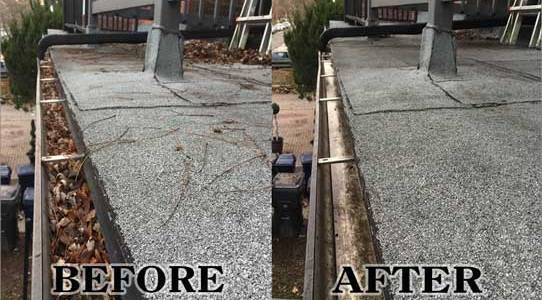 We will analyze what is required in order to provide the best and most appropriate type of eavestrough / gutter cleaning service for the situation at hand. If possible, we use our unique cleaning system which removes the most clogging causing debris in the industry. We will also customize the cleaning according to your needs. 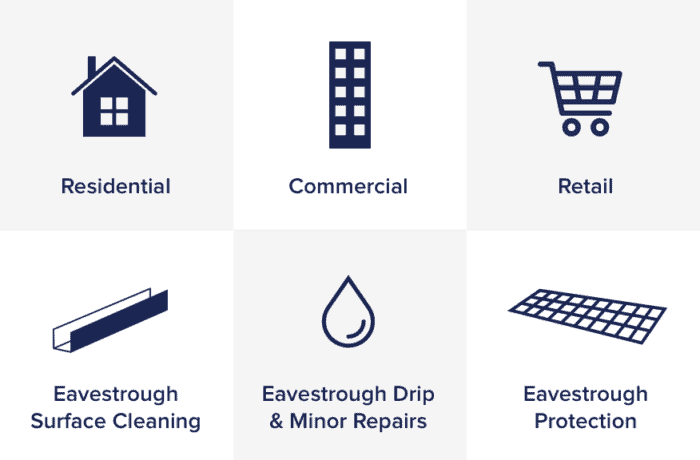 How often should an eavestrough cleaning service be done? While most people immediately think of Fall, experts know that eavestroughs / gutters should be cleaned a minimum of two times per year, or even more often when trees are close to the property. Why at least two times per year? Insurance companies know firsthand due to damage claims. Read a Blog posted by Allstate Insurance. There is another informative article at Angie’s List. It also nicely explains why and how important it is for regularly eavestrough cleaning. Do you need just the eavestroughs / gutters cleaned? What about cleaning the outer face of the eavestroughs with a service called eavestrough / gutter whitening, or minor repairs like, re-securing, or corner drip repairs? If you would like to eliminate the need to ever clean the eavestroughs / gutters again, consider our Patented Diamond Back Protection System.